Creamy Chickpea And Coriander Soup: Winter Warmer. Are you looking for a nice and tasty Winter warming soup recipe? Fancy making this Creamy Chickpea And Coriander Soup? Warm a large saucepan, spray 12 times with FryLight, add the onion and cook over a medium heat for 5 minutes to soften. Add the garlic and cook for 2 minutes, stirring. Reserve a quarter of the chickpeas, add the rest to the pan with the rice, turmeric, cayenne, lemon zest and juice and the stock. Bring to simmer then cover and cook for 25 minutes. In two batches blend the soup with the yogurt until smooth, if wished the soup can be passed through a sieve if a smoother soup is preferred. Return to the saucepan to re-heat gently. Heat a small frying pan, spray 10 times with FryLight then add the reserved chickpeas and cook for 4-5 minutes until heated through and beginning to take on colour. Stir the chopped coriander into the soup and serve with the re-heated chickpeas as a garnish. 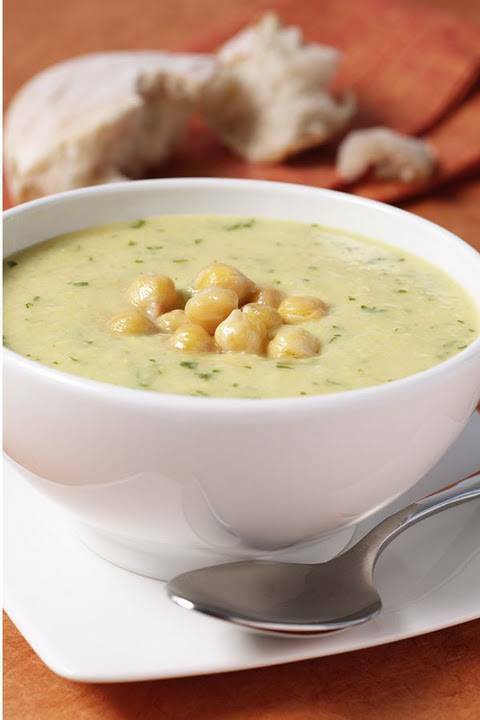 What do you think of this Creamy Chickpea And Coriander Soup recipe? Creamy Cavolo Nero And Leek Soup With Cavolo Nero Crisps. This looks tasty, is it slimming?????????? I so need to diet now!!!!! I would never think to put these ingredients together but this sounds delicious!